That scrape, ding or smudge on the wall bugs you every time you pass it, but can you really touch it up and make it look better? Wall touch-up paint jobs are notoriously difficult to pull off without making the new paint stand out, but you can increase your chances of success with the right tools and techniques. Doing a paint touch up properly can save you the work of repainting the entire room. The easiest match job happens when you still have the original paint you used on the wall as long as it's still in good condition. If you need new paint, the best way to match is to get the same brand and sheen in the exact color you purchased the first time. Flat and lower-sheen paints are the easiest to touch up without being noticeable, but you should always match the original sheen to make it blend in. If you don't have information about the old paint, you may be able to get a new container of paint at a store that offers color matching technology. With a sample of the existing paint, you can head to the paint store, where they can use a spectrophotometer connected to a computer to measure the color. The store can then try to recreate a match in a new can of paint. Before patching up the paint job, you want the wall surface to be as smooth and blemish free as possible to help the paint blend. Start by cleaning the area to get rid of any dirt, grease or grime that can affect how well things stick. Warm, soapy water and a sponge should do the trick. Towel dry the wall before you do any additional work. If the paint damage includes a gouge in the drywall or other damage, use a spackling compound to fill in the holes. Spread the compound into the space with a putty knife, feathering it outward with the knife at a 45-degree angle. Scrape away any extra compound and let it set for several hours. You can sand the dried patching material with fine-grit sandpaper if it's not level. It's also a good idea to prime the area you're touching up to help the paint stick better and to help with color blending. Choose a primer intended for indoor use with latex paint. A smaller paintbrush is usually best to help limit the primer to just the affected area. Wait until the primer fully dries before painting. If you're using the old paint for the job, stir it well to help mix the pigment throughout the paint. The best touch-up paintbrush or paint roller is just large enough for the job to avoid spreading paint too far into unaffected areas. 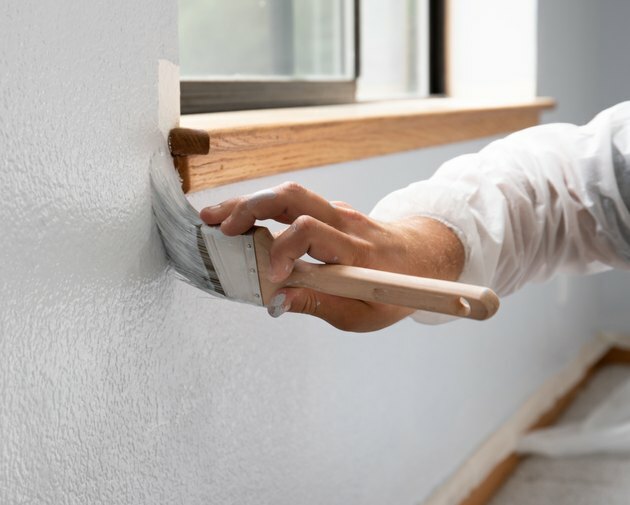 To get a similar finish on the new paint area, use the same type of applicator as you did on the first layer, whether that's a brush or a roller. If you're just covering a small missing piece or a scratch, using an artist's brush may be the best bet because you can just fill in the missing paint to make it less noticeable. Thinning latex paint with a small amount of water can help it blend in better. Start by applying it over the affected area, working outward and feathering the edges to help them blend. It's best to use smaller amounts of paint, adding more if you need it. Wait until the paint dries and look at it from different angles and in different light to see if it blends in well. If your touch-up paint dried darker or lighter than the original, you may need to think bigger. With a good paint match, you don't necessarily need to repaint the entire room, unless you're tired of the color and want to try something new anyway. Instead, you can often paint just the affected wall from one break to another. In most cases, that means painting the full wall from one corner to the other. If the paint is the same color and sheen, you likely won't notice the difference because the corners of the room give that break, and the results will be close enough to the other walls to make it blend in well.